What do the different colors on the appointment calendar mean? What's up with the different colors on the appointment calendar? We're so glad you asked! There are a few default colors on the appointment calendar to help you visually manage your schedule. Unavailable times will be shaded out in gray, whereas available times will appear as white. Client appointments will default to blue during the booking process, but you also have the option of changing the default color under settings of that service if you wish. You can tweak the color of an appointment on a case-by-case basis when you create the appointment as well. 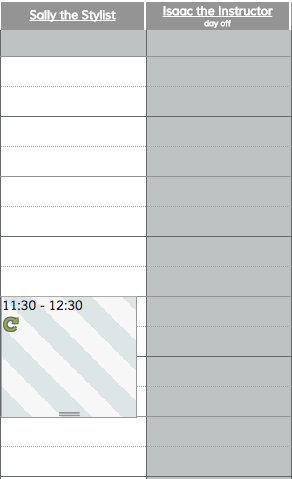 Personal time will display as striped in white and gray so you can easily view the times you marked as busy!